'fresh and eager...rich in character...so infectiously alive to the simple pleasures that even now the senses quicken to read it.' Jan Morris in The Times ...a brilliant picture of traditional English rural society ...(Parson Woodforde) is now among the most unforgettable characters of English literature.' Ronald Blythe in the Introduction The world in which Parson Woodforde lived was tumultuous to say the least. Yet while the French Revolution and the American War of Independence shook and changed the world, this kindly country prieSt fills the pages. of his diary with the ordinariness of his life, firstly in a Somerset parish and then in rural Norfolk. He accords no more importance to the Fall of the .Bastille than to the extra large crab he buys from a local fisherman or the cost of ribbons for his niece's hats. Particularly vivid are the descriptions of the gargantuan meals he enjoys * with friends and neighbours, his remedies for ailments, his descriptions of East Anglian winters, his modest but unfailing generosity to the poor and his enthusiasm for local gossip. 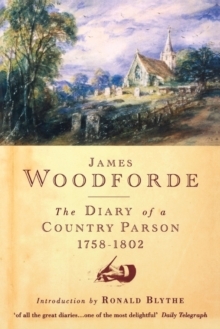 Parson Woodforde's diary provides an extraordinary portrait of life in Georgian England, but it is the diarist's humour and unpretentiousness which ensure its place among the classics of English literature.